"It was a whole new wave of approaching music. It was literally to go into the studio and come up with sounds and things that not only you haven't heard before, but maybe other people anywhere in the world hadn't heard that sound before. We were like revolutionaries. Sonic terrorists. We were going to force people to understand that there was kind of a new aesthetic here. This was the future and we were going to pioneer it. We thought we were killing off rock and roll." There is a defining visual in Eve Wood's documentary about the post-punk Sheffield, England music scene in the late 1970s, and it shows a man climbing the stairs of an overpass of some sort to dramatically hurl a guitar over the edge. Plexifilm wisely uses that striking image on the cover for this release, as that act of dramatic defiance was the underlying thesis for a group of musicians who formed various bands in the industrial shadows of Sheffield during the post-punk days to not just make music, but to reinvent rock and roll by killing it, or at least preconceived notions of what it should be. A number of bands that came out of Sheffield—Human League, ABC, Heaven 17—eventually achieved a modicum of success outside of England, but there were other groups—Pulp, Cabaret Voltaire, The Extras, Artery, Vice Versa—that were part of the same electronic musical uprising, and whose frenetically inventive catalog remains known to a very small number of people. Such is the case with revolution, music or otherwise, that sometimes the pioneers never get their just rewards, and though the radio-friendly danceclub works of Human League were an eventual evolution of their early incarnations, Wood lets Made in Sheffield trace the history only up through 1982, just before the fragments finally took root in more accessible, less eclectic directions. The doc is built around the detailed recollections of many of the leading players, including Chris Watson (Cabaret Voltaire), Martyn Ware (Human League/Heaven 17), Ian Craig Marsh (Heaven 17), Paul Bower (2.3), Jarvis Cocker (Pulp), and Phil Oakey (Human League), as well as John Lake and Robin Markin (The Extras). It may seem slightly Heaven 17/Human League-centric, but the stories are not the typical "boy, we were great and that was a time", and Ware especially is an eloquent speaker, tracing the history and the various band off-shoots into a logical evolutionary tree. Likewise with Cabaret Voltaire's Watson, a quiet and well-spoken individual who was the leading force in one of the most groundbreaking rock bands of the past quarter-century, certainly as pivotal as any of the original punk bands that came just years before. The fact that Watson never achieved the same level of mass notoriety as John Lydon, Joey Ramone or Joe Strummer is a genuine headscratcher that I will just never understand. This is definitely niche alternative music, and Wood makes good use of the 52-minute runtime to tell as much of the story as possible. Some of it moves rather quick, and if you're new to the genre it may take some time to connect the dots between bands. The influence of Kraftwerk on the movement was unquestionable, and musicians like Martyn Ware and Chris Watson did their damndest to retool the constructs of rock into something new and exciting, and just because their not as well known as Mick Jagger or Bono does not mean that they didn't succeed. 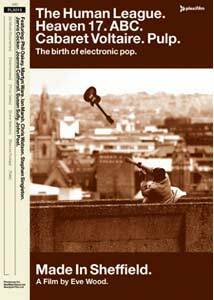 Image Transfer Review: Made in Sheffield: The Birth of Electronic Pop has been released in its original 1.33:1 full-frame aspect ratio, and considering this is largely interviews and archival concert footage the presentation is quite suitable. The interview segments understandably look the cleanest, with pleasing colors, and any image-related issues on the over 25-year-old concert footage are to be expected. Audio Transfer Review: The audio track is in 2.0 stereo, certainly adequate for a documentary and within acceptable limits for a film dealing so heavily with music. The musical elements are almost secondary—used as accents more often than not—and the core of Wood's film consists of the interviews and recollections, so the 2.0 mix is serviceable. Extras Review: Plexifilm has stocked Eve Wood's doc with extras that actually run longer than the feature itself. A set of five interviews (essentially longer versions of what eventually made it into the finished film) are included, with additional insight from Pulp's Saskia Renshaw and Jarvis Cocker (11m:50s), Human League's Phil Oakey, Joanne Catherall, and Susan Anne Gayle (06m:56s), Cabaret Voltaire's Chris Watson (18m:13s), The Future/Human League/Heaven 17's Martyn Ware and Ian Craig Marsh (13m:35s) and Vice Versa/ABC's Stephen Singleton (25m:05s). There's deeper content here that Wood had to chop for timing, and hipster Oakey speaks of the importance of his original lop-sided haircut, while Watson and Ware retain a low-key coolness that simply reinforces their presence as a pair of smart, articulate musicians with vision. Imagine that. A short set of live footage is provided, with single-song performances by three influential Sheffield bands. All the clips were recorded at the Leeds Futurama in 1980, and feature Vice Versa (02m:30s), Artery (04m:20s) and I'm So Hollow (02m:34s). The image and sound quality is surprisingly good, and any flaws are tolerable in exchange for seeing Artery in their prime. There is also an automated Photo Gallery (02m:45s), a 10-page insert booklet, with notes from director Eve Wood, as well as a "family tree" of Sheffield music. The disc is cut into a very generous 25 chapters. It's difficult to say how relatable a documentary like Made in Sheffield: The Birth of Electronic Pop is unless this was the music that actually pulled you through the late 1970s and early 1980s. Running just under an hour, the surface is barely scratched, but there is a hell of a lot of history here as director Eve Wood collects a large assortment of key musicians from the movement to recall what it was like in post-punk Sheffield as a new wave of electronic bands attempted to overthrow the very order of rock and roll.